Apolonia’s untimely passing at age 52, leaves a void in the world of Native American Art. Though small in stature, she stood large in life as she painted, sculpted and created strategies toward social change for Native Youth. She fought diligently to protect traditional fishing and sovereignty rights of her People. A member of the Tygh Band and Yakama Nation, her ancestral homelands are located along the Des Chutes River at Tlxni (Falls of a Woman’s Hair) also called Shearers Bridge. She held great pride in her Traditional fishing family and encouraged all who fished to respect the River and the Salmon. She was an enrolled member of the Confederated Tribes of Warm Springs. Susana’s paintings and serigraphs often contain the dramatic and diverse landscape and sky of the High Desert. Snowstorms and the elements of wind, water, Sun and Moon appear with vigor. 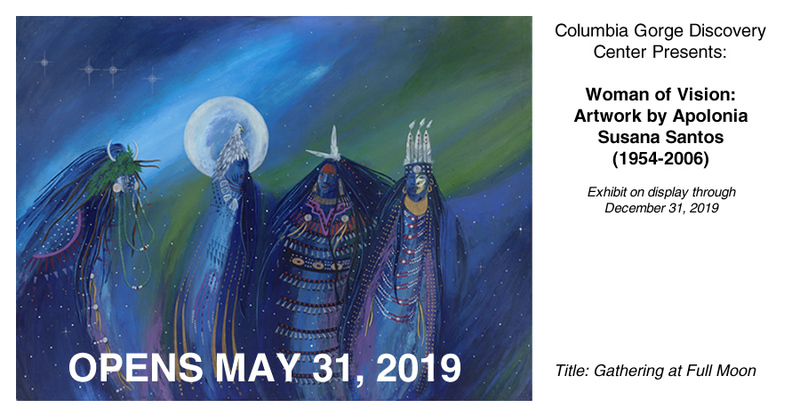 Her artistic interpretation of Salmon, Coyote and Big Horn Sheep express how strongly she was connected to her homelands. Interpretation of Native Women and Men in Traditional dress always has a contemporary flair. Her desire to preserve Indigenous ways and memory is apparent in her artwork and her activism.